of who we really are  and where we’re heading. Our world is in upheaval. And in Oneness, we are guided -- with timeless wisdom and unmistakable grace -- to understand why. Oneness, the Divinity we all share, has stepped forth in this monumental moment in human evolution, to spell out exactly how we’ve managed to create our own worst nightmares, as individuals and as nations, and how to shift those patterns. This is a world where the rules are changing before our very eyes. The pillars of so-called scientific proof that support much we have been taught to believe in have begun to crumble in the wake of another kind of truth -- a profound sense of Divine connectedness we have begun to unearth from within the depths of each of us. In this groundbreaking material, we have been given the formula for thriving in the uncharted world at whose very edge humanity now stands. Here we learn how reality is manifested vibrationally and how our emotional responses set the stage for drawing our life experiences to us. We learn to recognize the signs and symptoms of the ascension process  the shifting of our awareness to accelerating levels of reality  and how to harness its potential. Filled with profound metaphysical concepts and catalysts for change, Oneness speaks in a voice that is non-technical and in the same breath, indescribably loving and personal. 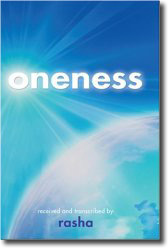 This book takes us to the outer reaches of our own humanness and to the depths of the Divinity within. Reading it becomes a sacred, experiential journey that leaves the reader empowered with timeless tools for real transformation and a clear roadmap of the inner path to enlightenment. Copyright © 2007 by Rasha. All rights reserved.